I remember our first day in Spain like it was yesterday. It was a surreal and shocking experience to say the least. As soon as the front door of my host family’s apartment opened, all I could think was “what have I gotten myself into?”. The sudden emersion into the Spanish language was, for someone who has never studied Spanish before, a little scary. With the blink of an eye I had crossed the threshhold of the trip I’d been dreaming about since last fall. I was in San Sebastián: where the food is meant for all to have access to, and the sun doesnt set until nearly 10 pm. Standing on the shore of La Concha that first night I had no idea how this trip would play out. 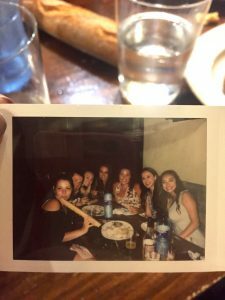 But thanks to the structure of this specific study abroad, quick friendships were able to form and cement themselves within these 3 weeks. Friendships that we will most definitely continue to grow and cultivate back at Umass Lowell. The very structure of this trip that allows for such friendships is simple. 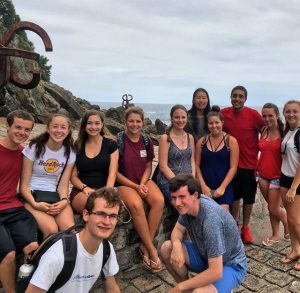 Throw this group of college kids into a foreign country and let the culture and cuisine of the Basque country overtake them: even overwhelm them in part. This will draw them nearer to each other due to the sharing of such a new and large scale experience. Our almost daily excursions with our professor also helped to show us the wonders of being abroad, whilst creating the perfect atmosphere for us students to become close friends. 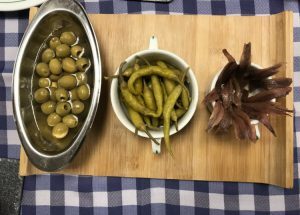 For example, during our pintxo tours we had to encourage one another to try some of the more daring culinary dishes our professor ordered, such as octopus or ox tail. On our free days we had to support one another when our Spanish skills fell short, and we had to watch out for one another while we explored the city at night. It became evident through our actions how much we cared for one another. We would always tell group members to “text us when you make it home safely!”. Grant even came to the bus stop in the rain at 8 am just to say goodbye as some of us left for the airport, which was very sweet. There were so many amazing experiences I had while on this trip, and I’m glad that along the way I made new friends to remember those experiences by. I am of firm belief that getting to study abroad brought us closer together than we might have been if we didn’t have our amazing professor to teach us and lead us around the city. Thanks to him and this trip, I feel like I really lived in Spain. 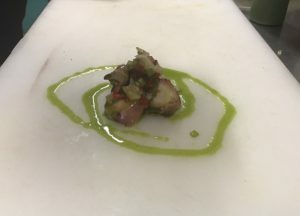 I learned Spanish and Basque language, recipes, and customs. Most importantly, I feel connected to the city that I now know so much about. And I’ve come to realize how much I miss San Sebastián. I miss the sounds I heard at night through my bedroom window; the laughter, the ocean, and the distant music from jazz concerts along the shore. I miss walking everywhere, especially to the stunning beaches. I miss having my friends to explore with and try new things with. And just hours from my departure, I could undoubtedly confirm that the scariest part of our trip wasn’t the arrival. It wasn’t not knowing how to speak the native language of this land or going through the airport by myself for the first time. The scariest thing about this trip is that it will never happen again and I don’t want to forget it. I don’t want to forget how it felt being 19 and in Spain for the first time. Or how amazing it was to be studying Spanish and immediately getting to practice it out in the city. I don’t want to forget all the beautiful places we visited and the various people we met from around the globe. I dont want to be anyone but who I became on this trip: the person who tries new things and says yes to experiences that might scare them. And I most definitely will not be in Spain again with the best group of friends I could ask for and our wonderful professor. To love something so much, and know it’ll never happen again in the same fashion is heartbreaking. But like I told Aislinn after she had finished her last bite of the worlds best tortilla, “don’t be sad it’s over, be glad that it happened”. Thank you Honors College at Umass Lowell and Prof. Z for making such a powerful experience possible for our group. I will be forever grateful for this trip and what it has done for me as a person, and I’m sure my classmates feel the same. As our adventure here in San Sebastián nears to an end, it is impossible not to think about our time spent here so far. Personally for me, the idea of leaving my home, family, and of course my dog to go to a foreign country seemed like a daunting task. I had never been outside the United States before, and even living at college, UMass Lowell was about a 20 minute drive from my house. However, shortly after being here, the apprehension faded away as I realized I had found a new sort of family and a temporary home here. Today started as most other weekdays since we’ve been here. While some days we ate breakfast with our host family, today we went to our favorite cafe in the neighborhood, Ogi Berri. This little bakery and cafe is one of the only chains I have seen in my time here. Then we went to class and on our break, we sat in the same cafe, around the same table, we have sat at every day since we’ve been here. It’s funny to think that we almost feel as though we have a claim to a few little things in this city despite having only lived here for less than three weeks now. 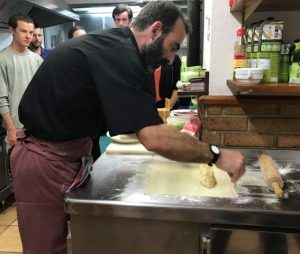 However, after class, instead of going out and walking through Parte Veija, eating pinxtos at pintxo pote in Gros, or hitting the beach, we went back to our house to get ready for what was sure to be the highlight of the day: our farewell dinner and tour of a Basque Cider House. After getting all dressed up for the night, we took a bus to Petritegi Cider House. The sidrería has been around for generations, since the 16th century, and currently the 6th generation is operating and running the business. Behind the building we were going to be eating at later, lied rows of apples of various varieties. The orchard itself grows 16 different kinds of apples consisting of multiple acidic, bitter, and sweet types. However, only a small amount of sweet apples are used in the making of the cider. One of the first things we did was taste regular apples and the apples used for the cider to experience the difference between the two. The cider apples had a much more potent taste than the apples we are used to back home. After this, our guide explained to us the process behind making the cider itself. They harvest all of the apples manually by using a stick with a nail attached. Given this day and age, it is fascinating that they still use this method. In order to cultivate the best apples, every three days from September-November they gather the apples that have fallen from the trees. The reason they do not take them from the trees is because they are at there best when they naturally fall. From there the apples are cleaned and fermented in a process that seemed similar to the process explained to us at the winery. Petritegi cider is made 100% natural. This means that if not for the fermentation process, it would actually be just apple juice with no preservatives or additives. Once they are placed in the barrels, the cider can only remain for 4 months without turning into vinegar. Because of this, it is moved gradually to colder cellars to slow down the reaction process. After this informative and interesting tour, we were brought into a room to try 2 different ciders and chorizo. One cider was made with 100% basque apples, while the other had apples that were imported as well. However, the real star of the tour was the chorizo. All of us were in agreement that the chorizo at Petritegi was the best we have had since being here. However, while the actual tour and details we learned were interesting and an amazing way to spend the night, it was the dinner that truly made me realize how much I am going to miss this experience. While trying different batches of cider, we were given a feast of tortilla with bacalao, hake, steak, cheese, cookies, and, as always, as much bread as we could eat. Sitting around the table with everyone was a perfect farewell. We talked, laughed, and overall just genuinely enjoyed each others company. Many of us made promises to one another to hang out during the school year and it was overwhelmingly bittersweet to realize this trip was coming to a close. Even so, at least I can say I may have only come here having one friend with me, but I am leaving with many more. We became a sort of family in San Sebastián, and I will always be grateful to have shared this experience with each and every person here. It’s true what people say, the best things happen when you least expect it. 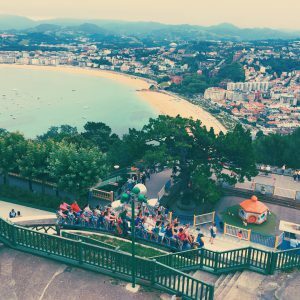 I never expected to live in San Sebastian for three weeks. Furthermore, never could I have imagined being here with this specific group of people. Yet, now I can’t imagine it any other way. I expected the beautiful beaches and incredible gastronomy. After all, three of the top fifty Michelin star restaurants are housed within the city and this was where the Royal Family and aristocrats came to escape the court. Yet, they have not been the most memorable for me. 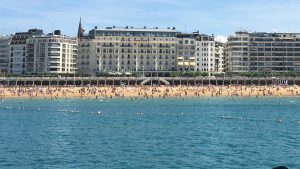 In the city surrounded by tourists, it is easy to believe that is all San Sebastian has to offer. However if you keep your eyes open, San Sebastian never fails to surprise. Whether its a coffee shop surrounded by bars or a mixed media painting along a tunnel, each time I step out onto the street I find pieces of history tucked away in the most unexpected of places. For instance, located at the top of Monte Igueldo, is the Parque de Atraciones. This amusement park dates back to 1912 and hosts Spain’s third oldest funicular. There you can relive your childhood with a ride on the merry-go-round, bumper cars, and boat. You can also enjoy a view of the city on a ride around the mountaintop. But, what never ceases to amaze me is how well the amusement park is integrated with its surroundings. I would have never guessed there would be an amusement park on top of Monte Igueldo despite the number of times I’ve seen it from afar. Similarly, the Comb of the Winds is an collection of sculptures that not only accentuates its surroundings, but tells a story of San Sebastian’s past, present, and future. The locals were fishermen and sailors who depended on the wind to survive. At the base of Monte Igueldo, the most prominent sculpture represents the present. 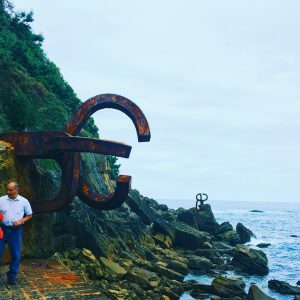 Directly in front is the sculpture seated in a island shaped by the water and wind, representing a past where the Bay of Biscay had not existed. Meanwhile, seated at the horizon, farther away, is the future. However, unlike other installations, the Comb of the Winds does not dominate the space it occupies. Rather, it allows the wind and the waves to speak for themselves. The plaza leading to the sculptures is full of holes that make sound as water passes through. The sculptures themselves are open to the elements and blend with the granite allowing it to evolve alongside the city of San Sebastian. The emphasis on preserving history and the natural beauty of the city is what makes San Sebastian so special. While back home space would have to be created in order for an amusement park or sculpture to be installed, here they add to overall character and history of the city. Combined with the relaxed atmosphere of the city and its inhabitants, I am always left wondering what else there is left undiscovered. I have no doubt the best is yet to come. Errealitatea ez da ipuina, nobela handi eta gogoangarria da. “Reality is not a short story, rather a large and memorable novel.” Just one of the many brilliant quotes told to us by celebrated Basque author Bernardo Atxaga toda. Like every morning, waking up was a struggle for my roommate Grant and I. No matter how nice and cozy our beds felt, we knew what obligations awaited us. At 10:30, our group met at a bus station to head to the village of Asteasu, the hometown of Atxaga. After a 20 minute bus ride, we arrived in this quaint little village. My first impression was a nice, quiet, somewhat desolate town. However, I soon learned that this impression was false as quite a few famous people were born there including Atxaga, the coach of the Spanish national team and his family, along with the coach of Barcelona. A couple minutes after arriving, a small older man in a suit jacket walked over to us. We immediately realized this was the well-known author Bernardo Atxaga. He proceeded to show us around his home village consistently stopping to talk about oral stories passed down through time such as the kids who got infected by rabid dogs or how the church came to this village and dominated it which helped build the culture of the area. The views are as breathtaking in Asteasu as San Sebastian’s own vistas. One of the best sights in my opinion so far was the wide range of grassy plains and hills along with the houses perched atop them. Quite a breathtaking image to take in. Another sight that was far more reachable while equally as aesthetic was the church. It truly personifies the culture and beauty of the village. Part of Atxaga’s short story Young and Green actually took place on the steps of this church. According to Atxaga, religion was a heavy influence in the village. It helped modernize, and acted as a form of unification. For example, there were unique bells that tolled for different situations. One chime was for alerting of fire, one was to announce a death, and one even signaled the start of a fiesta. Clearly the church played a massive role in shaping today’s society. After discussing religion, politics, and a few other topics, we headed back down to indulge in some fine cuisine. It was undoubtedly the most delicious and filling meal I’ve had in my two weeks here. 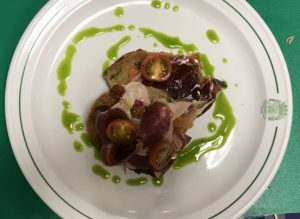 From a numerous appetizers to fish and meat entrees, with tiramisu for desert. It was truly a full course meal and the end to a well-spent day in Asteasu. Bernardo Atxaga imparted some sage wisdom to me that I will keep in mind. When expressing my gratitude for welcome us into his town, he responded that “Reality is not a short story, rather a large and a memorable novel.” These are words to live by: It’s necessary to have a complete life full of adventures and experiences instead of just short snippets. Our time is short and we must make the best of it everyday. Excellent advice from the kind, clever, and humble author Bernardo Atxaga. This morning, after having filling breakfast at with our host families, we headed off to Spanish class where we honed our conversational Spanish skills. Once Spanish class was over we got lunch and went off to Santa Clara, the island off of the coast of San Sebastián. We took a boat cruise tour to the island. 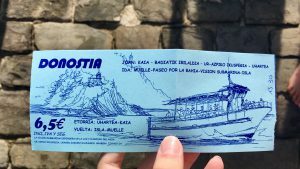 The tour boat went through the harbor of San Sebastián and around Santa Clara. On the boat we also got to see the beach La Concha from a completely different view. I also personally love boats so this was definitely a highlight for me. 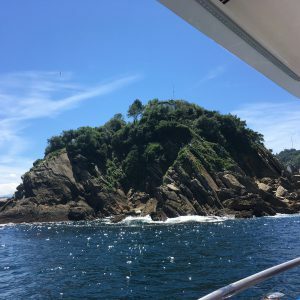 Not to mention we got to see La Concha from the boat, which was absolutely breathtaking. Until this point I didn’t think that San Sebastián could become more beautiful. Of course, I was completely wrong. Not only were the views on the boat amazing, but so was the boat ride itself. 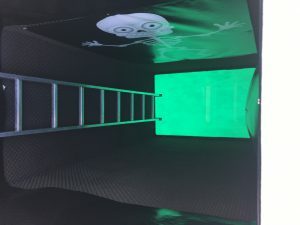 There was a spot in the middle of the boat that allowed you to look down through glass to see the water going by down below. It gave us all some amazing pictures and a nice ride to Santa Clara. The boat ride alone gave me a thirst for adventure that I don’t think I’ve felt in years. After the 30 minute boat ride we docked on Santa Clara. To say the island is magnificent is an understatement. The island had picture perfect water that sparked like a starry night, the type of water that you just wanted to jump into immediately and never leave. I was rather disappointed we couldn’t go in as soon as we got there, but it was more to look forward to after class. A fun fact about Santa Clara is that its beach disappears at high tide, so you can only truly enjoy it at certain parts of the day. I find this to be a fascinating little secret, more discovery at every turn, and I absorbed every ounce of it. After a short but steep hike we got to a grassy spot over looking that sparkling water, and we began our class. We discussed a book that we were assigned and some of the political history it goes over. For our trip we read All That Followed by Gabriel Urza, a work of fiction based on real events and stories in the Basque Country. The book went into the ETA, a terrorist group that was based in the Basque Country in Spain, as well as the stories of a few people who’s lives changed because of them. The author tells a story where the majority of the book is based on the past rather than the future or present of the characters. Something I found to be different as rather than wondering how the book will end in terms of events, you focus in on the people that said events had a direct effect on. What I liked in particular about this book is how it was a classic example of don’t read a book by its cover, that is in respect to the characters. The three characters that the story follows are easy to make assumptions about when you first read the book. Mariana, the poor widow of a politician who was murdered five years earlier and left to raise her child by herself. Then there’s Iker, a wild teenage radical who helped in the murder of Mariana’s husband. Lastly there’s Joni, who has spent fifty years in Basque country whom, according to the locals, has and always will be a foreigner, but is still there anyways. As I read the book, I discovered that there was so much more to them than my initial assumptions. The more you know, the less you know, in a sense. It made me question my assumptions on things and people in general. I feel as though besides telling a story, it teaches us to truly double check before judging something or someone. As I read more about these people, I wanted to learn even more. We also discussed something that I’ve been curious about for months. Why haven’t I heard of San Sebastián, or Basque Country for that matter, until I signed up to come here? Well the answer to that lies within its history. Back in the 1980’s and 1990’s the ETA caused a lot of violence and unrest in the country. The Basque Country was then used as a scapegoat after the Spanish Civil War for much of the suffering that occurred as a result. 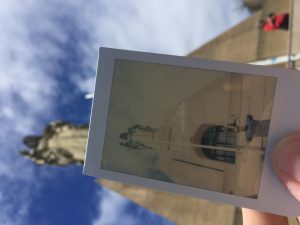 The Spanish Civil War sought to get rid of what made Basque Country so unique and amazing. Nearly a whole generation of Basque natives didn’t get to learn their own language due to it being banned by Franco. When the ETA was formed, among many other reasons it started the violence for the of independence the Basque Country, to seek justice for the crimes committed against its people and to give a voice to them when it was taken away. When I learned about this history it made me think of how sad it must have been to have your own culture denied to you. It also made me think of how big our world truly is in respect to its history. Like how a Western European country had a dictator for a good portion of the 20th century. As I think about how such things did happen, it makes me question what could happen in the near future of our country and the developed world as a whole. This group of terrorists, which took nearly 60 years to disband, made it easy for the rest of Spain to blame Basque Country for so much violence and chaos. The Basque Country as a whole was, in a way left alone and forgotten by many people. 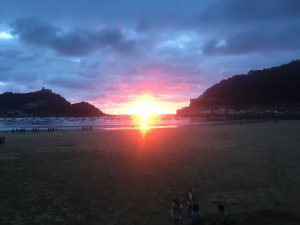 Although peace has been here for a quite some time, San Sebastián as well as its surrounding cities and villages remain a hidden treasure to much of the world. It is due to this sad fact that places such as San Sebastián remain undiscovered by many travelers. 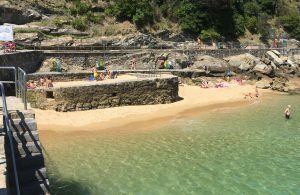 When we were done discussing All That Followed and Basque Country’s recent political history, we finished the trip by swimming in the sparkling, refreshing water that surrounds Santa Clara. It was a great way to end such an amazing class. 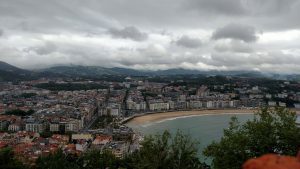 I hope that in the coming years that San Sebastián and the other places like it will no longer be known as a hidden treasure, but rather as a well known place in the world. A city that more people dream of going to and want to experience for themselves. It’s a place I’m glad to know exists, I’ve never seen such stunning scenery. In a way I’m glad to be here now before this treasure is more well know to the world, it allows me to experience the city in depth first hand before it gets overwhelmingly crowded. There is a beauty to it that is simple yet so complex at the same time. It’s clean, open, warm, sunny and uplifting. It particularly ruins other places for me because of that. In the only two weeks we’ve been here I can already tell that this world has so much to it that I want to discover and see with my own eyes. San Sebastián is a majestic part of our world and I’m glad that I have the unforgettable opportunity to truly experience it. Everyday, I start my morning with a nice walk to Spanish class that does not highlight the history this city has endured at all. 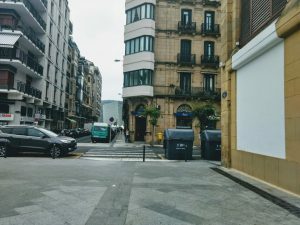 Despite the endless beauty and entertainment found around every street corner, it’s the patience and pride of the locals makes San Sebastián easy to call home for the weeks that we are here. However, the most exciting part of the day begins after Spanish when the city opens up and becomes our classroom. After class, there seems to be an infinite amount of restaurants and cafés to choose where to get your next pintxo or bocadilla. Today, I decided to eat just a baguette for lunch. The bread made in the local bakery has a distinct freshness that is not mimicked in grocery stores in the United States. After a filling lunch, our group hiked up Mount Urgull and set up class there, isolated from the busy streets and crowded beaches. The hike displayed characteristics of the city’s history. The stairs were excruciating at points and although many tourists and locals make the hike to see the statue of Jesus, the trail does not lose its lush green areas and historic aspects. Along the hike, there were cannons that prove that this city went through some difficult times before it became the safe and accepting place that it is now. Furthermore, the sights from the mountain capture the beauty of the beaches, and the unique architecture that defines the area. Mount Urgull was the perfect location to discuss some of the works of the popular Basque author, Bernardo Atxchaga. We discussed some of his short stories and excerpts such as The Mystery of Four Birds, Obaba’s First American, Esteban Wendell, and Young and Green. Atxaga is one of the few authors who writes his stories in Basque to preserve the language and to pass the story down within his village. Bernardo Atxaga is important to Basque history. Unlike many modern authors, Atxaga does not hesitate to include certain details. He writes about protests in the Basque Country and the struggles that the area has been through. These include the assassination of a young politician and an organization, the ETA, that focused on breaking free from the Spanish Union. The ETA disbanded slowly and was one of the last terrorist organizations to be in Europe. Bernardo Atxaga acknowledges the history of Basque Country through various themes in his story. He repeatedly writes about this idea of being trapped to signify citizens wanting to break away from the Spanish dictator at the time. He also has repeated themes of family and isolation. 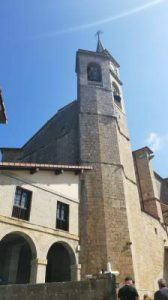 Atxaga’s themes demonstrate the values of the Basque people that still hold true today as this is a very social city where all of the locals enjoy talking to one another. 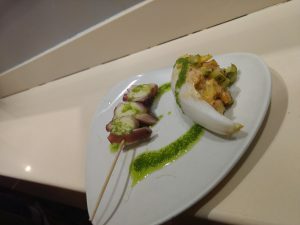 To finish my night, I participated in pintxo pote in parte gros of the city. 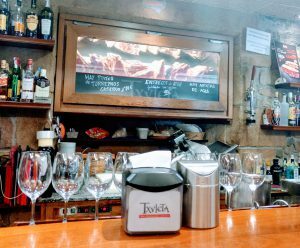 Every Thursday, pintxo pote draws a big crowd as every bar in this part of the city offers a pintxo and any drink for two Euros. 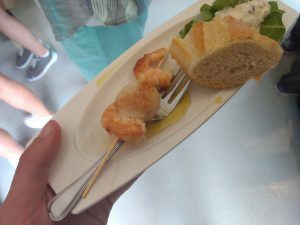 Locals and tourists fill the street and enjoy pintxos together while getting to know each other and the servers. 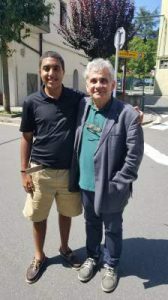 Atxaga is an iconic member of this community and it is amazing to be able to live in the setting of much of his work and the discussion atop Mount Iguela prepared me to meet him on Saturday. Despite being so drizzly dreary today, I’d say that our second Monday here in the city went quite well. Just another day of going to class, eating food and climbing a mountain for me. 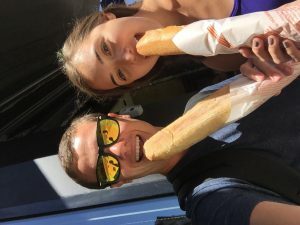 First off my roommate Ben and I arose in preparation for week two of our Spanish language class at Lacunza school, part of the international house chain that operates study abroad institutions across all of Europe and some other Asian countries aside. To prepare for the day’s academic rigors, we eat cereal, and dang it is some great cereal. 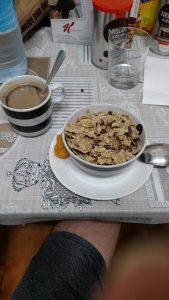 Haven’t had anything like it back in the States; a lightly sugared bran that holds firm, even when drizzled with comfortably warm milk. It’s peppered with a dash of chocolate shavings that melt into every decadent spoonful! It’s also pretty healthy according to the box. I knew food was important here but I can’t say I expected even boxed cereal to be better than back home. In between all that savoring, I often chat with one of my host family’s five members. I talk the most with the grandmother, but we share this moderate apartment with her daughter, son-in-law, and two grandkids, with others stopping in for visits intermittently. Given the appartment’s centralised location, within walkable distance to nearly everything in the city, our house acts as a hub for the whole family in their urban work. After a decidedly damp walk to class, we began our respective studies. Fortunately for me, my parents had decided it important to enroll me in Spanish classes earlier than was typical for my Massachusetts education. In turn, they added familiarity awarded me access to a more advanced class that puts forth topics allowing me to add some nuance to my speech that I’d never learned previously. Once class ajourned, my friends and I set about making good on our free time. 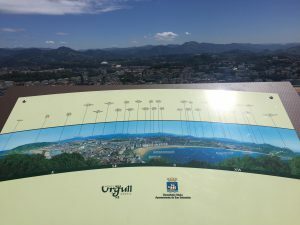 Having eaten lunch in Parte Vieja of potato tortilla (which in this part of Spain actually means an omelette), we then decided to scale the hill Urgull to visit the dated Spanish fort and statue of Jesus that sits on high above the city. Littered with winding stone staircases and terracotta roofed barracks long since abandoned, the path leading up was filled with nooks to explore. One such offshoot was a derelict english graveyard, carved arbitrarily into the cliffside. At the cemetery’s end stood monolithic platforms supporting what almost appeared to be an altar. In reality this was the the graveyards dedication, a obituary commemorating the British casualties of the First Carlist Wars. 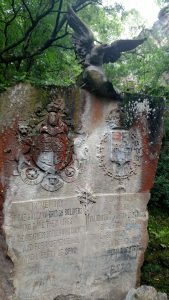 Upon return, my searching yielded that this monument served to remember a battle particular to the region in the English aid to Maria Christina and Isabella II and their defence against the reinstatement of monarchy by the Carlists. Additionally, the view from the top of the mountain was sensational. However, the day’s main event was yet still to come. Our UML planned activity for the evening was a Basque language class. Here in Basque Country, the natives are extremely proud of their cultural heritage. So proud, in fact, that their unique traditional language dating to millennia ago has persisted relatively unchanged. 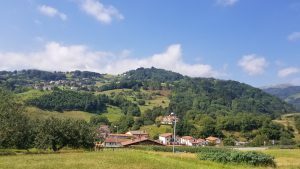 Euskal, or the Basque language as we’ve dubbed it, is one shrouded in mystery. There are no languages with which it shares a structure. Knowledge of it’s origin is guesswork at best, though a common suspicion is that it shares cultural heritage near the Bay of Biscay with the Celts and gaelic. It is a veritable alphabet soup of x’s, z’s, and unique pronunciations. A language as befuddling to speak as it is elegant when spoken. And in one of the great hubs of Basque culture, what better teacher to make the introductions to this ancient tongue than a singer from Scotland? Stewart, musician turned proprietor of local language institutes and a good friend of Julian’s was drafted to instruct our group. We learned a gauntlet of useful words, phrases, and syntax. To name a few we got a grasp on bat through hamar (bah-t, hah-mar, meaning 1 through 10). We found out that arratsalde on (are-rrat-sal-day on, meaning evening good) is used most of the day, but that gabon (gah-bohn, translates as good night) is for entering and leaving a resteraunt after 10 PM. A letter z is spoken like the soft sss of a snake hiss, and the letter a at the end of a word means “the (main word)”. All in all, Stewart was able to answer all our questions competently and with impressive charisma, and the day had an interesting and fulfilling end. Today was a day of breath taking views and authentic wine. Our group toured the Talai Berri vineyard in San Sebastián, which is the only place in the world that can produce Txakoli. This wine is special to the Basque Country and the local people. Txakoli is served at all of the local bars and restaurants. What makes this wine different is not only that it is produced in San Sebastián, which in my opinion is one of the most gorgeous places I’ve seen, but the way it is made and poured. The wine must be poured from high up to break the wine and aerate it, making it even more uniqueness . We learned the process from a fifth generation wine maker, who takes care of all factors of the production of the wine. She had learned everything from her family. The business being in the family for so long shows just how important family is in the Spanish culture. From grapes on a vine to the refreshing white wine served in a glass, she knew all their was to know. The vineyard was 90% white grapes and 10% red, but all the grapes are harvested in September. The first batches of Txakoli would be done in December. We saw how the grapes are juiced, cleaned & fermented. From there the wine would be bottled to be drank and sealed with a cork and a label. Seeing the difference between the way other wines are made gave our group insight on just how original this wine is. After learning the process, we got to try the hand crafted creation over looking a spectacular view of the vineyard. Txakoli is a young wine, meant to be drank that same year. Making it different from other wines most people enjoy, never the less Txakoli is just as amazing. We saw the rolling hills and straight rows of grapes, which promote equal distribution of water and sunlight. The view was breath taking and paired beautifully with the young wine. It’s true what they say, wine is made in some of the most beautiful places on earth and we were able to learn and witness that very thing. 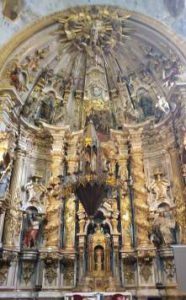 When our tour was finished, we explored the city and walked the path of the pilgrimage, which is a popular tour Catholics take through the basque area. We learned that those partaking in the pilgrimage walk an average of 27 miles a day. Through the walk, we could see more and more rolling hills which eventually lead to the beautiful beach. It seems that everywhere you turn, the views only get more and more breath taking. I don’t think a picture of words could truly describe just how gorgeous it is here in San Sebastián. One of the hills that sticks out in my mind the most was an Island shaped as a mouse. Our tour guide pointed out this natural creation, showing us another unique aspect of the beautiful country. Our tour guide has been so insightful, answering any question we can come up with. He makes our experience that much more educational while still having us experience everything San Sebastián has to offer. Although we’ve only been in San Sebastián for a week, I feel as though I’ve been fully immersed in the culture. Although it’s outside my comfort zone, I love being able to experience other people’s culture. Pinxto tasting has been one of my favorite days of the trip so far because of one simple reason: I love food. We began the day at 1:30 PM after classes had concluded and headed to Merkatua, an underground market located in Parte Vieja that features a wide variety of local merchants as well as various restaurants, including a small handful of Pinxto bars, which we visited with Professor Zabalbeascoa. There, he ordered myself and the five of my groupmates three different tortillas: one of which that had anchovies, the other mushrooms, and another which had squid (including a good amount of ink on the side too). Each of these tortillas were impeccable and it was at this point where we learned a valuable tip about eating pinxtos. 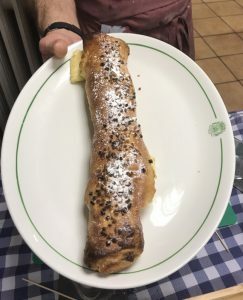 That is that bread, which was served at almost every single place we went to, can be used to scoop up the pinxtos and adds a nice surface for the sauces to soak up with. Once we finished with the market, our intrepid group of hungry students headed back to street level and walked a short distance to Haizea, a small hole in the wall bar and favorite of Professor Zabalbeascoa’s. 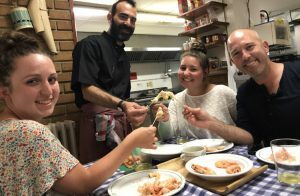 What made this place great was not just it’s excellent food, but also the owners: an older couple who cycled through the massive amount of patrons and their various orders yet also keep a smile on their faces. The pride and cool which bartenders and chefs alike display in these places really makes San Sebastián such a unique location and is quite a culture shift from the United States where oftentimes you can be faced with anonymous, faceless employees which only have profits and paychecks in mind rather than providing genuine service. I digress, however, as after our stop in Haizia, we headed to the heart of Parte Vieja during the busiest time did the day for the bars. After wandering past dozens of places that were absolutely swamped with patrons, we stopped at this place whose name I unfortunately didn’t catch and where myself and another student in the trip ordered stuffed squid which was not necessarily my favorite meal of the day but at the very least I can brag to my friends and families about the meal I had there. One peculiar detail about this bar was that the bartenders would toot a little horn whenever they got a tip which was hilarious and broke up some of the insanity of the busy day. 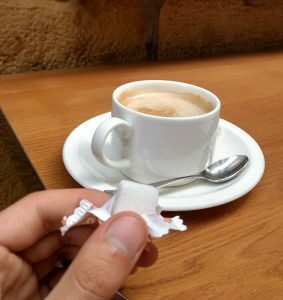 With this, Professor Zabalbeascoa revealed an interesting but of information about the tipping culture in Spain and the fact that people generally don’t tip as much, often leaving one or two euros rather than a portion of the check as they would in the United States. After this, we hit a couple more spots and came to probably my favorite meal of the day, which was octopus tar tar. Now while my dish was absolutely incredible, it was also slightly difficult to eat because of two dishes that some of the other students on the trip ordered which blew smoke into my face and the entire restaurant since they were served on a sort of “minature grill” that had a piece of charcoal burning underneath to smoke the food. I did not end up trying their dishes but I saw and heard from them that it was an absolutely incredible mix of fish, a bit of starches, and even a shot of cilantro which I had never seen in my life before. That bad in particular was filled with some of the most oddball food I have ever seen in my life before, including a dish made of riverworms. I will definitely have to visit again. Finally, we finished our grand tour with slices of cheesecake and café from this beautiful little bakery which was planning to close up before the evening time reopening which is a schedule most shops around this past follow. I definitely will remember this as one of the best days on my trip.